A pair of excellent new music concerts on the Houston calendar this month illuminated the distinct yet overlapping currents that shape the body of contemporary music. At the Rec Room, with the lights of downtown skyscrapers reflected in the windows, all eyes in the darkened room were drawn to the dramatically lit stage artfully crammed with an array of percussion instruments. The Texas New Music Ensemble (TNME), under the capable direction of artistic director Chad Robinson, began its sixth season with a thoughtfully curated program of music for percussion. 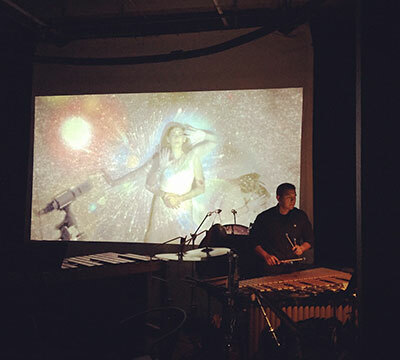 Percussionist Jacob Adam Garcia performing Die Sternklare by Joseph Klein. The featured composers, all Texans of course, were Joseph Klein (University of North Texas), Rob Smith (University of Houston, Aura Contemporary Ensemble), Phillip Elder (UH graduate), Peter Lieuwen (Texas A&M), and Chad Robinson. Dallas-based percussionist Jacob Adam Garcia manned the entire gamut of instruments with complete assurance. The five pieces provided well-tuned degrees of contrast in sound-color, structure, and aesthetics. Joseph Klein’s Die Sternklare (Starry Woman) startled and mesmerized in equal measure. On the screen at the back of the stage an image of a celestial woman loomed large in a universe of countless stars, draped in white, shunning the light. She is the “Starry Woman,” a surreal character from Bulgarian-born, British-Austrian writer Elias Canetti’s 1974 book Earwitness: Fifty Characters. Poetic imagery was a strong force throughout the composition. Brazen, hurtling, wide intervallic secco figurations on the vibraphone are interrupted by blindingly bright pings on the crotales; the temple-bell like stillness of the gongs toll steadily above barely perceived, seemingly random rhythmic and melodic movements on the vibraphone; the glass chimes and tams-tams color the mysterious universe with scattered starlight and shattered illusions. 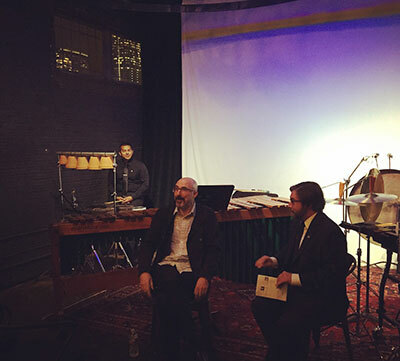 TNME artistic director Chad Robinson chats with Houston composer Rob Smith about his piece Breaking Point. Mr. Garcia was at the center of it all, bowing and striking, switching between variously graded mallets, turning this way and that to synchronize or interrupt, all the while holding that strange otherworldly vision, the Starry Woman, together. Rob Smith uses a variety of found objects in his piece Breaking Point. 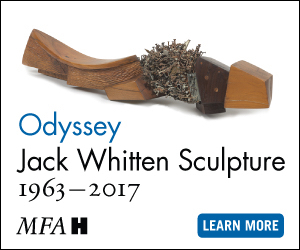 Inspired by a 2008 exhibit of ceramics and metal sculptures at the MFAH, Smith unlocks the kinetic force lying dormant in industrial brake drums, garden variety clay pots, and a metal can, among other items. Concise yet inventive, the work is tightly structured and easily accessible. The muffled voices of clay pots hang in a fragile moment at the center of the composition, framed by the relentless rhythmic drive of the outer sections on metal objects. The two pieces for solo marimba each took advantage of the considerable possibilities of the instrument. Chad Robinson’s The Path at Night, a meandering piece of fleeting gestures and timbral nuance, evoked the slightly unsettled feeling of navigating the unknown. The quiet rattle of the wood end of the mallet absorbing the vibrations of the keys was especially effective in creating a sense of unease. Percussionist Jacob Adam Garcia performing Breaking Point by Rob Smith. Philip Elder’s Stove Top Trio is a pure showcase for the virtuoso marimbaist. Mr. Garcia covered the entire 5-octave range of the marimba with nimble movements, lightly articulated phrases, and effortless execution. The last section came with a funny yet entirely appropriate name (“Wormburner”) that perfectly describes the sense of thousands of notes rolling at blistering velocity just above the grass. Peter Lieuwen’s 1987 work for vibraphone and alto flute Shadows of Winters Passed was the only work on the program composed before 2000. It is surprising that so few pieces have been written for this combination, given how naturally their timbres match. Flautist Meg Griffith and Mr. Garcia voyaged through the shifting textures and varied soundscapes of this expansive work with sensitivity. Dark, warm, tonal colors contrasted sharply with dry, bony passages. The finely controlled ending was all murmuring caresses, mist, and dew under a lonely winter sunrise. Craig Hauschildt with the Loop38 Ensemble. 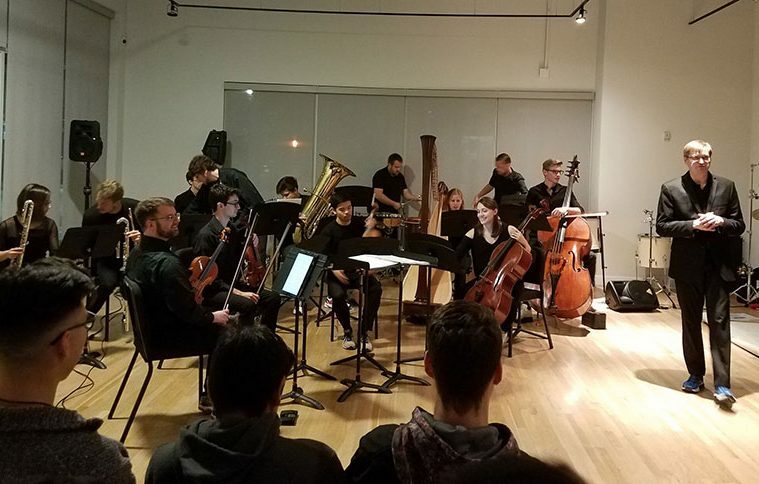 At the MATCH gallery space, Loop38 officially began its third season with an audacious concert of three lengthy electro-acoustic works that explore the physicality of sound and challenge the definition of music itself. There was a palpable sense of renewed purpose and energy in this young ensemble. After a blockbuster debut season that culminated in Haas’s in vain at the Rothko Chapel, the group was relatively quiet in its mostly collaborative second season. The collective, now co-directed by pianist Yvonne Chen, bassist Austin Lewellen, and percussionist/conductor Craig Hauschildt, certainly threw down the gauntlet with this difficult opening program. No other group in town is performing works this avant-garde, this unconventional, and this challenging, both for the performers and for the audience. 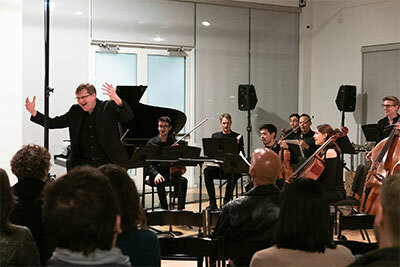 Conductor Craig Hauschildt led the audience in a vocal fry warm-up before launching into Norwegian composer Maja Ratkje’s And sing while thou on pressed flowers dost sleep (2012). It was a playful introduction to what was to be 20 minutes of extended vocal fry inspired sonic transmutations. At the heart of the piece, the composer’s pre-recorded voice roamed the acoustic space, provoking animated feedback from the array of winds, strings, and percussion. At times the voice’s feral power took on a strangled ferocity approaching madness. In response, I heard chickens in the slaughterhouse, cows in distress mooing en masse, a sickening rumble, a horror movie soundtrack, siren calls from an alien realm, and frequencies that make one’s ears ring, even hurt. 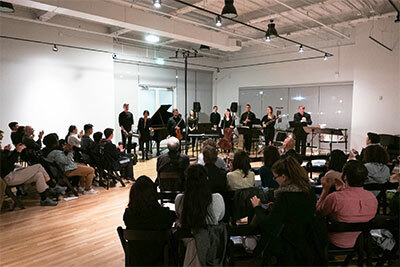 Loop38 Ensemble; Photo courtesy of Loop 38. Pure, singular textures emerged out of the schizophrenic insanity, no more grounded in reality than before. We are trapped in the head of the composer, her wildly imaginative psyche temporarily transferred and imprinted in our memory. The ensemble created the brutal landscape of industrialization through a plethora of extended techniques. Instruments became machines. The steel-wired piano strings were variously scraped, strummed, swiped, and tapped; at other times they were struck with a mallet, attacked with linked chains, and covered with a towel to produce ominously muted thuds. The winds shrilled to multiphonic effects, buzzed through flutter-tongued lines, and punched with resonant grunts. Bows scratched, attacked, and ricocheted on metallic strings. Screeching, repeated up-bow strokes close to the bridge produced insistent ostinato rhythms that drove the narrative. The most visceral sounds came from Austin Lewellen, who cut a dramatic figure as he maneuvered a large rectangular steel plate with rust-blackened gloves. The deafening clang of hammer against steel, the unbearable sound of a metal file scraping the plate’s edge, were a kind of torture that simulated the physical pain and mental anguish Luxemburg must have endured. In contrast, Lewellen’s haunting voice cut through the savage violence in passages of pure tonal beauty. It is difficult to snap out of such an intensely gut-wrenching work and hyperjump into an entirely different sound terrain, but that is what the audience was tasked to do. Ashley Fure, known for collecting, harnessing, and sculpting sounds from anything and everything, created an actively physical environment in Albatross (2014), where audio samples of live dancers are deconstructed and reassembled by the instrumental ensemble through unexpected and exaggerated action. Imagine putting your ears against the floor during a dance performance: the scuffing and pattering of feet, the squeaking of shoes, the attack of toes against hard surface, the swoosh of air in a leap. Feel the vibrations of thud-pound-stomp. Then listen to the dancers’ skin and breath. Now take all of the energy in those unwanted sounds and translate it into action throughout the ensemble. The musicians’ sneakered feet rubbed and tapped the ground as instruments smeared and smudged, filling the space with a dense texture of onomatopoeic sounds–click click, whoosh whoosh, squeak squeak, moan moan, murmur to thunder. The physical elements manifested themselves not only in the precise execution of a wide spectrum of extended techniques, but also through the theatrical, choreographed movements in the ensemble–an upward tilt of the head in unison, a collective forward lean, the fluttering of fingers as pairs of musicians touched palm to palm, and finally all eyes closed and all sounds dissipating with one last sweep of the bow on the cello. It is saying something that the Ashley Fure work turned out to be the most accessible piece on the Loop38 program. She is on the cutting edge of the avant-garde and one of the most imaginative and unconventional composers working today. She revels in unstable and complex waveforms, bucks against the constraints of the notation system, and talks about injecting volatility back into the performance to mitigate what is lost in the process of notating the abstract sound worlds in her head. When the cymbal stand crashed to the ground in the opening seconds of the work, it may have been just the volatility Fure was hoping for in a live performance. The process of putting together a program of this scope, difficulty, and level of unfamiliarity could not have been easy. 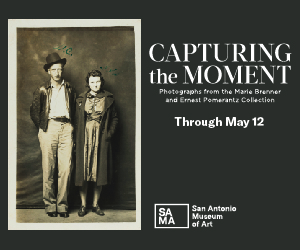 The group’s collective passion for experiencing and sharing avant-garde works is obvious. Each one of the works on this program, however, took time and effort to absorb. Experiencing all three in quick succession was disquieting. We are in a new era of contemporary music. Stylistic and aesthetic boundaries are blurred, rules and taboos exist only to be broken, and the delineation between music, sound, noise, and performance art is obscured. You might hear Ashley Fure at the New York Philharmonic, Gabriel Kahane on tour with the Punch Brothers, or Caroline Shaw collaborate with Kanye West. Houston has its ears open, to the music of its own composers, and to the wildly diverse sounds from anywhere in the world, whether they disturb or inspire. We have groups like TNME and Loop38 to thank for that.